I really like the part that talks about how proper ritual supports the structure and renewal of the Cosmos from a Proto-Indo-European perspective and a Proto-Indo-European concept called Yewésa (rules by which 'proper' rituals are conducted). This Proto-Indo-European approach to ritual is shared by Jewish tradition as well which prescribes 613 overall mitzvot (ritual commandments) and a myriad of halachah (Jewish ritual laws) designed to do just that (support the structure and renewal of the Cosmos). So, while this book, Deep Ancestors, examines Proto-Indo-European tradition specifically, esoteric knowledge of the workings of the Cosmos must have been known in the ancient world more widely than it is today. 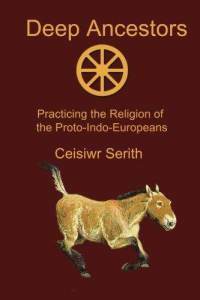 Most mystics today are all about evolving consciousness and use ritual toward that end or to achieve some practical result, but Proto-Indo-Europeans and ancient Semitic people both viewed ritual as a set of acts aimed to carry out our responsibility to the Cosmos. In follow-up to my previous post about hitting a deer earlier tonight, before I had the dream I mentioned in that post, I had another dream about a Lion sleeping in the garage (not attached to the house). Apparently, we are in a Leo Full Moon conjunct Mars. Interesting. Last night (early this morning actually) I dreamt that a huge tsunami wave overtook some man and he went somewhere and came back. Then the tsunami wave overtook me and took me to an Ice World in another dimension. I am assuming it was Niflheim. Let me tell you, it was sooooooo beautiful and pristine! I really can't relate to you just how stunningly lovely it was. I wasn't cold in it either. I didn't want to come back, but I did. Later today, coming home from dropping off packages at the post office after dark, nearing my house, two deer ran out into the road from the woods (I live in a rural area). I slammed on my brakes, but I hit one. I don't think it was fatally hurt, as it got up and ran off into the woods. It didn't look like it had broken legs or have any blood on it, it just seemed dazed, so I am hoping it will be ok. There's a slight indentation on the top of my hood near one headlight, but in the dark, I think that's the only damage to my car. The whole thing could have been fatal to both myself and to the deer, but I think we both escaped with minor injuries. I've never hit a deer before, even though I see them cross the road here all the time. I look for them after dark and drive slower, thank goodness. These two just came out of nowhere (my lights had been dimmed for an oncoming car). I thanked Hel for guarding my life and the life of the deer. ... then there was a fog. The German Nibelungen — with the corresponding Old Norse form Niflung (Niflungr) — is the name in Germanic and Norse mythology of the royal family or lineage of the Burgundians who settled in the early 5th century at Worms. The vast wealth of the Burgundians is often referred to as the Niblung or Niflung hoard. In some German texts Nibelung appears instead as one of the supposed original owners of that hoard, either the name of one of the kings of a people known as the Nibelungs, or — in variant form Nybling — as the name of a dwarf. Perhaps I am of the lineage of the Nibelungen. Why is the monolith broken? For the deceased to enjoy the grave goods in the next world, the goods must first be “killed.”Breaking (or burning) is a way of killing an object. But, if the person is not dead but alive during some particular unusual death-like state of being, and is meant to return to the land of the living, to this world and not to remain in the otherworld, I would think it would be good then not to break a monolith. I wonder, what exactly, in esoteric terms, is a monolith? According to our legends, the three founders of the Odin Brotherhood (“Mocking-Defiance,”“The-Power-of-Innocence,” and “Desire-to-Rebel”) were buried together in a special mound called “The-Mountain-of-Promise.”Tradition states that each of the three monoliths placed with their bodies was the size of a living man. I wonder what more there is in tradition about the monolith associated with the Power of Innocence? with the dwarf at your right hand, walk to locate "the Crypt of Secrets" containing "the Scroll of Knowledge" that will lead to "the Mountain of Promise" - the crypt is located between "the rock that bleeds" and "the river that laughs"
I personally can't help but link in my mind this Mountain of Promise with my experience when I was 6 years old, where when "coming down" I was given a promise in exchange for letting go the "treasured possession" I tried to hold and contain within my child mind.